August Bank Holiday Monday is almost upon us so it’s just about time to roll into the biggest gospel music event to take place in Sheffield. 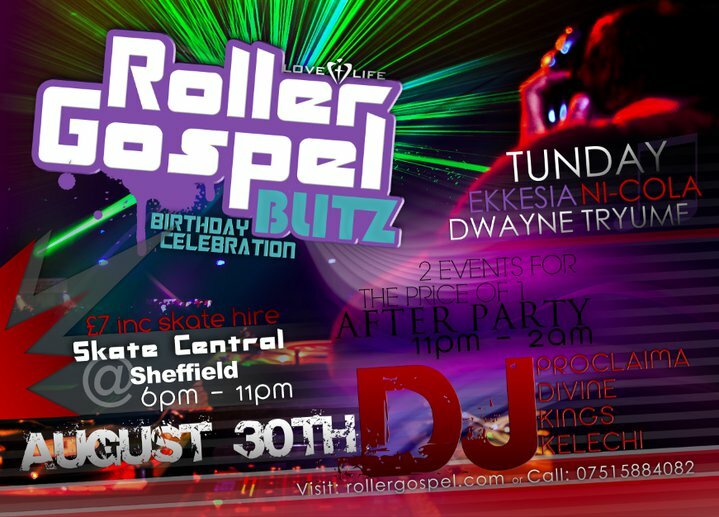 Roller Gospel Blitz returns to Skate Central for its birthday bash with a huge lineup and a celebratory after party. Roller Gospel Blitz is always an exciting and popular night and a particular favourite of mine because it takes place in my home town of Sheffield. But as always, they’re expecting people from all over the country to come and enjoy some good gospel music and a whizz around on some skates. DJs on the night include DJ Divine, DJ Proclaima, DJ Kings and DJ Kelechi. Plus, PAs on the night will come from Tunday, Ekklesia, Dwayne Tryumf and Ni-Cola. Once youve got your skates off at 11, the after party kicks in and carries on until 2am. If you haven’t been before, make sure you head down on Monday 30th August to Skate Central on Queens Road in Sheffield. A meager £7 gets you entrance to the main event, skate hire and entrance to the after party. Oh, and if you decide to make a day of it in Sheffield, I’ll be more than happy to give you a few pointers on what to see and do in the Steel City! Previous Post Midnight Oil 2010 – Tickets on sale now!